Use Catch the Best to save time while reviewing resumes, and to save your email inbox for all the other important things you have to do. Having your job posting show up on Indeed is as simple as checking a box. Updating your job ad will signal to Indeed that your listing should be updated. Get everyone on your team involved, without having to forward emails and attachments. In fact, you can even divide and conquer the work of screening and filtering your applicants. Posting your job ads to Twitter, Facebook, and LinkedIn is a one-click affair from your job page. When you share, special links will be automatically created that will track how each applicant found your ad. Like a CRM system, easily track every email sent to or comment made about candidates in your system. Now you never have to wonder where to pick up the conversation with a candidate. I am not a recruiting professional but hiring for my department is part of my job. A solution like Catch the Best allows me to spend less time managing this hiring process and more time on my core responsibilities while still feeling confident the team is communicating effectively about candidates. If you’re like us — recruiting from multiple sources (Monster, LinkedIn, our own website), and want to have more than one person on the front line of screening those candidates — a tool like Catch the Best is essential. We've used Catch the Best to fill three positions so far and we are very happy with it. The application itself is completely streamlined and makes it easy to go between candidates and positions. 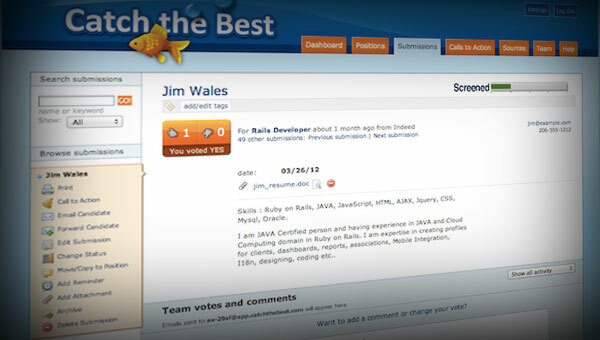 We also really appreciate the comments and voting features so that team members can be brought into the hiring process. Lastly, the ability to track where the responses are coming from is also very useful for us when trying to determine where to spend our hiring dollars. Keep up the good work.